Based on your date and time of birth if available (but not necessary) we create, starting from today, a yearly forecast for the next year, highlighting the positive and negative astrological aspects in detail. 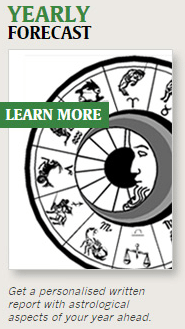 This profile is written by some of the world’s leading astrologers. Please use local time (as displayed on the clock). If you don’t know your time of birth, don’t guess. Though slightly shorter in length a Flat Chart (without time of birth) is more accurate than one where the time of birth is out by more than one hour.